Cesium is one of the alkali metals with chemical symbol Cs and atomic number 55. It is solid and golden at normal pressure and temperature, is highly reactive with water and air, it must be placed in sealed glass ampoule under argon only. Cesium is an incredible element because melt in your hands at body temperature. If you take in your hands the glass ampoule, after several minutes you can see that all the cesium before liquid becomes liquid, looks like pure liquid gold. There are four isotopes of Cesium, 3 of them are radioactive, we don't sell these isotope, but we sell the stable and natural cesium metal (not radioactive), called cesium-133. 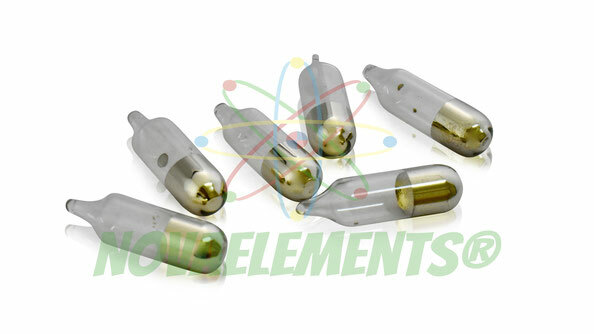 We supply this element at the purity of 99,99% in an argon sealed glass ampoule. High purity Cesium metal element 55 sample of 20 milligrams in argon sealed ampoule, inside a beautiful glass vial professionally labeled, Pure Cesium metal sample. DISCOUNT CODE NOT AVAILABLE FOR THIS ITEM! High purity Cesium metal element 55 sample of 0.15-0.20 grams in argon sealed ampoule, inside a beautiful glass vial professionally labeled, Pure Cesium metal sample. DISCOUNT CODE NOT VALID FOR THIS ITEM.